I’m inured to ineptly expressed messages on parking signs, but the signage reproduced here prompts a ticketing spree by the spelling police. 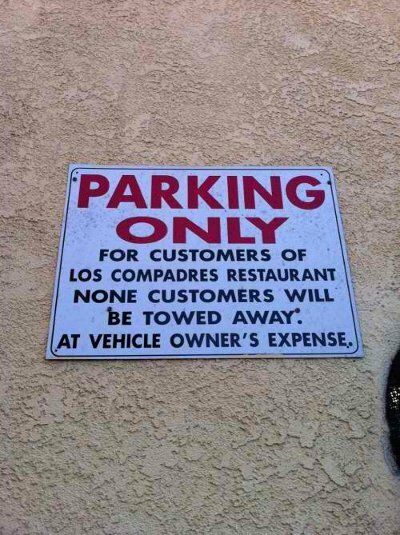 That’s comforting to know that none customers — I guess that means “no customers” — will be towed away. (Sometimes, after I dine at a Mexican restaurant, I feel like I need to be towed away — or, better yet, hoisted onto a flatbed truck.) Oh, I get it now: noncustomers. What really clinches this failure of a sign is the gratuitous period after away, and the resulting fragment that follows. 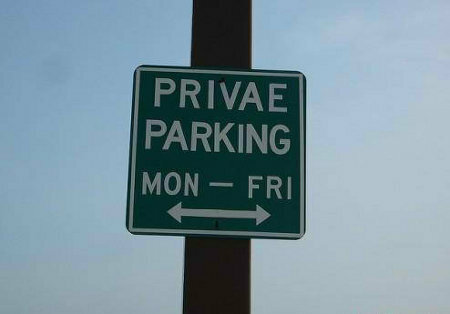 What’s a privae, and how does one park it (or them, as the Latin plural appendage -ae seems to indicate)? 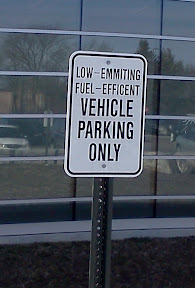 How kind of the sign maker, by the way, to refrain from taking up all that space on the weekends with a fleet of privas. 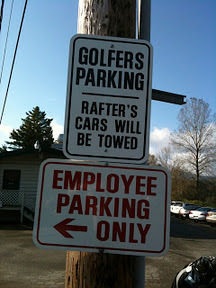 Here, two possessive nouns are rendered erroneously in different ways: They should read Golfers’ and Rafters’ (unless, of course, the sign is targeting a single rafter). These images are from the websites Apostrophe Abuse, Funny Typos, and The Great Typo Hunt. OMG! You’ve inflicted us with “signage.” Haig would be so proud. These signs of the times are indeed disheartening, but the poor vocabulary and grammar used in the comments above is just as disheartening. First, “They ever so regretful that” should probably have been either “They are ever so regretful that” (awkward), “They ever so regret that” (also awkward), or “They regret that” (best). Second, advertising is not inimical to hyphenation. It’s the other way around. Hyphenation is inimical to advertising, i.e., in the minds of advertising copywriters, hyphenation is injurious to advertising. Advertising has no effect on hyphenation. Third, the lack of a hyphen is not “the most ubiquitous signage error.” Substitute “blatant,” “obvious,” “egregious,” “common,” “widespread,” or “prevalent” to make the point. That’s why so many of the up-and-coming NPR journalists can’t pronounce “Iranian,” “triathlon,” or “athlete” correctly, misuse “podium” for “lectern,” and can’t master the more subtle homographs like “protest,” “defense,” “combat,” etc. They emulate non-professionals and, in the process, pollute English. Also, I suspect that the “commercial” in “commercial advertising” is superfluous. Is there “non-commercial advertising”? Isn’t advertising, by definition, commercial? But you are obviously missing public service advertising. It’s definitely not for commercial use. I always tell people of the dangers of relying on spell check. Spell check won’t catch it if you leave the ‘l’ our of ‘public’. 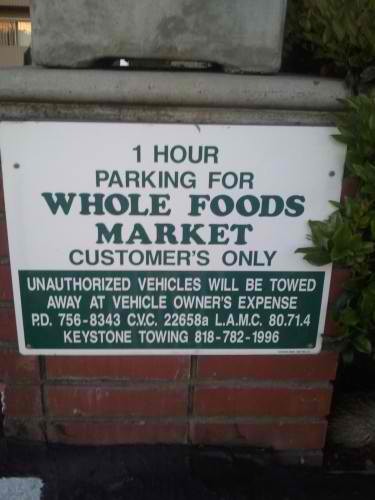 Purely correct grammar lost its parking place to alliteration. OF COURSE public service advertising is noncommercial advertising! Who didn’t know that? Furthermore, any kind of advertising that is not paid for is noncommercial advertising. How do you get that? You find a cause that is so worthy of being advertising that you can find skilled people who will do the work as volunteers. Next, volunteers with donated materials can produce handbills or posters and then staple them onto indoor or outdoor bulletin boards, fences, and telephone poles. Oh, “telephone poles”. In North American, those frequently carry electric power lines, but we call them “telephone poles”, anyway. I reckon that in some Eurasian and African countries, they still call them “telegraph poles”, but most of us would underestand. If the cause is truly GREAT, one might be able to find a company that is willing to donate some free radio or TV time for noncommercial advertising. You could also deliver noncommercial advertising by imitating Paul Revere, in a way, by riding a donkey through the middle of the city and blowing comprehensible messages on a bugle. Tough job! Better: borrow a public-address amplifier system to mount onto the top of a borrowed auto, and then drive though town making loud announcements of whatever you need to say. My father and I actually did that decades ago when we lived in a village, and he was helping out with the annual Independence Day barbecue event. He just drove around and around in the village making announcements starting at about 10:00 a.m. to remind the folks about the annual barbecue. **Many of us were taught that when we are a guest for dinner at someone’s house, and there is something on the plate that we absolutely will not eat – but the hostess or host is very insistent, then we should not create a loud scene about it. Just switch over to “Plan B”: figure out some way to feed it to the dog! Ukraine, Uganda, Peter Ustinov, the Greek letter upsilon, Eurasia, upsiedasium**, the Euphrates River, Utah, or anything else that starts with the sound of the letter “U” is out-of-bounds. Note that I just disowned Utah. That is a strange place, anyway. Colder than Canada in the wintertime, but hotter than the Mexican desert in the summertime. **I bet that you don’t know where this one came from! “Signage” is a quite poor word and an unnecessary one to boot. There are several quite efficient ways to express the same notion by using a few short, common words that have been with us for thousands of years. From reading in the Wikipedia, “signage” seems to be one of those ugly “vogue” words that catch on despite their “prima facie” problems. It just came to me: the nasty of all the nasties: “irregardless”. UGH! The word that the speakers need is “regardless” because that expresses the idea that they are trying to say. However! The prefix “ir” is a negative one, and that negative suffix cancels with the negative suffix “less”. Hence, the “ir” and the “less” cancel each other out as a double negative, just like (-1)(-1) = +1. What is left is “regard”, and I imagine that this one could be expressed as “regarding” to make it into an adjective. That is the exact opposite of what the speaker mean to to say. Actually, there was a lamebrain from the other side of the ocean who argued at me that mathematics and language did not have anything to do with each other. I told him that math and language are twins, born from the womb of the same mother. Still, he argued until I just told him to shut up, and I turned my Internet connection off. Now, we have seen a crystal-clear expression of (-1)(-1) = +1 in pure language: ir+regard+less = regarding. String him up! That’s why so many of the up-and-coming NPR journalists can’t pronounce “Iranian,” “triathlon,” or “athlete” correctly, misuse “podium” for “lectern,” and can’t master the more subtle homographs like “protest,” “defense,” “combat,” etc. Not sure what you mean re “Iranian”. Rhymes Ear-Ray-Knee-Un is fine for GenAm. Ear-Ran-Knee-Un passes but is probably not best. Ear-Ron-Knee-Un is affected. Just as an aside, from the NPR-types, w that are real ear-graters for me are species as spee-Seez instead of spee-SHeez, and ne-go-SEE-ate for ne-go-SHEE-ate. They are ever so press-ious. @D.A.W. : RE Upsedasium — Hey, Dale, watch me pull a rabbit out of my hat! >RAWR!< No doubt about it; I gotta get another hat. Where does it say this is acceptable in the UK? Lots of people do this, but it doesn’t make it any more acceptable. Lots of people commit crime in the UK, but the crime doesn’t become more acceptable the more of it exists. 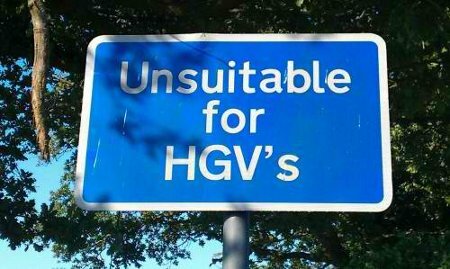 There’s no reason that writing “HGVs” (more than one HGV) would cause confusion with “HGVS” (some acronym other than “heavy goods vehicle”), so there’s no need for an apostrophe. It’s just another example of people assuming that because a word ends in the letter “s” it needs an apostrophe. Plenty of people assume that “weird” is spelled “wierd” but that doesn’t make it right, or acceptable through common usage.